Orvis Pro Tips - What Does "Anodized" Mean for a Fly Reel? Anodizing has a big effect on a reel’s durability and color. Anodizing is a chemical process that creates a coating on the surface of a metal (usually aluminum), which makes the metal more durable and resistant to scratches and dings. Anodizing also increases corrosion resistance and makes the metal easier to dye. Reel manufacturers use aluminum because it is so light, but it’s also quite soft. Without anodizing, an aluminum reel would not be very durable.The most common method of anodizing involves dipping the aluminum in sulfuric acid and then running electrical current through the acid. This causes aluminum oxide to form on the surface. Unlike iron oxide—which we call “rust”—the aluminum oxide does not flake off and is, in fact considerably harder than bare aluminum. Because this film of aluminum oxide is somewhat porous, it can be dyed or painted various colors. 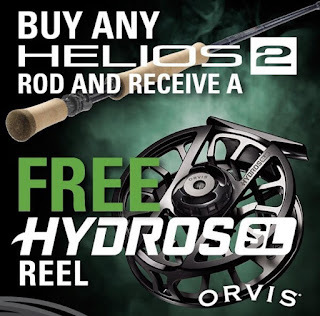 Also, for those of you looking for one of the greatest fly-rods in production today, Orvis is holding a truly awesome promotion on the Orvis Helios 2 rods. 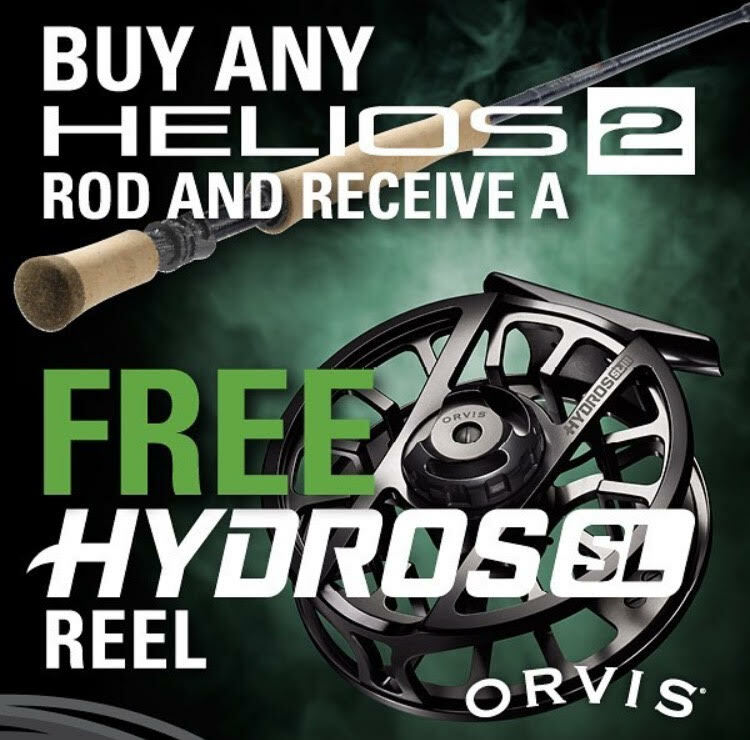 With any purchase of an H2, you will also receive a Hydros SL reel. 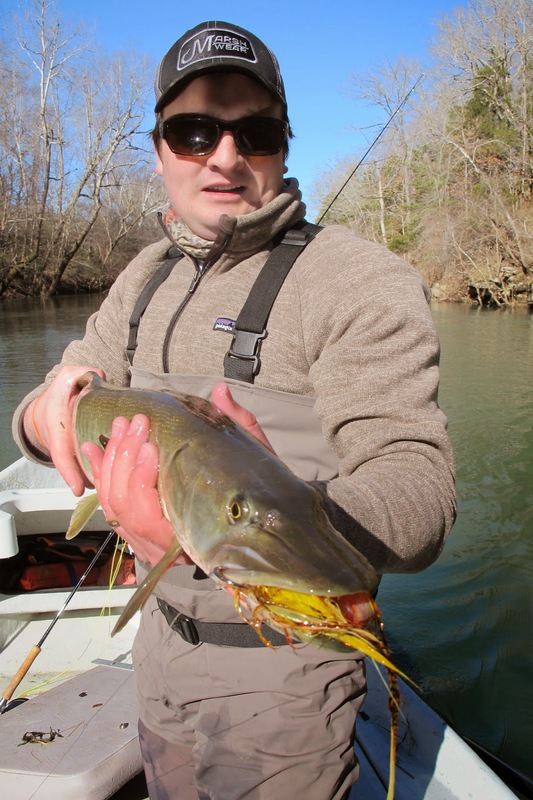 Many of our guides and employees have been fishing the Orvis Helios 2 for quite some time and we love them. They are light, strong, and although they cast smoothly, the Orvis Helios 2 possesses plenty of strength in the bank for those larger fish. The Hydros SL is a bit newer to the market than the Helios, as it was only release at ICAST last year, however we have already put them into rotation in our guiding outfits and client gear, and they have performed flawlessly. Many of our guides have also come to love these reels for there smooth drag, high retrieval rate, and indexed drag knob, making it easier to adjust the drag mid fight with that fish of a lifetime. 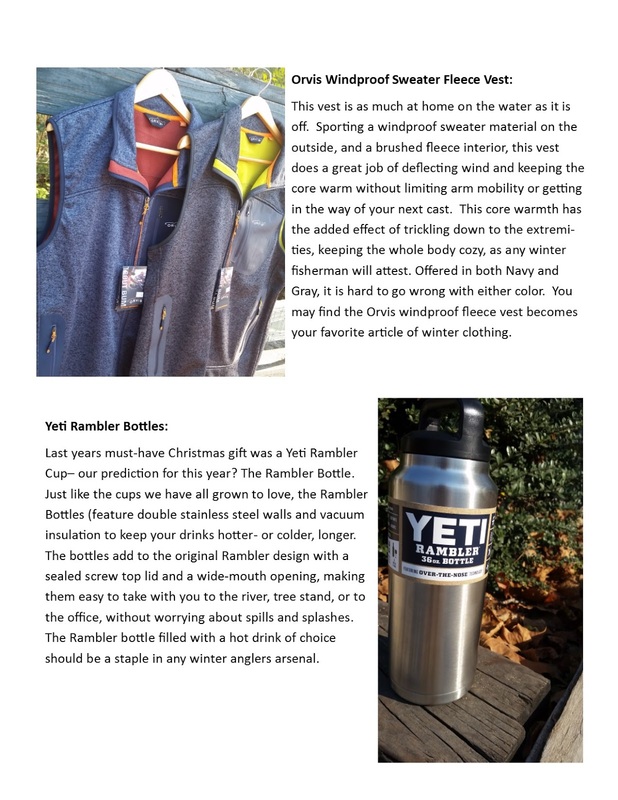 With Christmas just around the bend, We here at Unicoi Outfitters decided to piece together a list of some of our favorite pieces of gear for the seasons ahead. We tried to exclude the obvious- like fly rods and reels, and waders and boots, and instead focus on some of those pieces of gear you may not have thought of, heard of, or seen before. Enjoy and Happy Holidays! To See the Pages better, just click on "em! There is currently a big media push concerning the Chattahoochee National Forest's management plan for what is being referred to as the Coopers Creek Project. There have been editorials and newspaper articles across the state and yesterday I received an unsolicited email from "Protect Georgia". I'm not familiar with them but they are mounting a campaign to encourage people to oppose the Forest Service plan for Coopers Creek. They list among their supporters most of the Riverkeeper organizations in Georgia. I just wanted to let you know that Protect Georgia, Georgia ForestWatch and the Sierra Club are using a lot of misinformation and outright lies in their efforts to block this project. Photos of huge clear cuts, threats to brook trout streams and songbirds are all being thrown in the reader's face as the horror story the Forest Service is about to wreak on Coopers Creek. None of this is true. It's all an effort to create an element of fear in the mind of the general public. I am not recommending a stance on this project, although I will acknowledge that I support the Forest Service on this, but I do want to encourage our followers to become familiar with what is being proposed and not assume these groups are giving the true story. Here is a link to the Forest Service's Fast Facts on the project. There is also a 200 page Environmental Analysis available for more detailed information. You may also be interested to know that the Georgia Department of Natural Resources supports the plan. Unfortunately, in today's world, it's easy for narrowly focused groups to flood the airwaves with their agenda irregardless of the facts. We need more conservationists and we need watchdogs but we also need to be honest. Please take a moment to learn what this project is truly proposing. And then I suggest you make your feelings known to the Forest Service. ending on the depth and current speed of my fishing locale. Long fluorocarbon leaders were key to punching through current and delivering tasty morsels to the resident fish. It was a fairly normal angling day for the winter time but believe it or not, I caught more fish on the soft hackle than I did anything else. A slow deliberate raising/lowering of the rod at the end of the drift was deadly and even fooled a couple of nice sized “PHD” trout too! If you didn’t get outside yesterday and instead opted to watch Carolina’s clinic against the Cardinals or Peyton VS Brady, at least know that your opportunity was there! 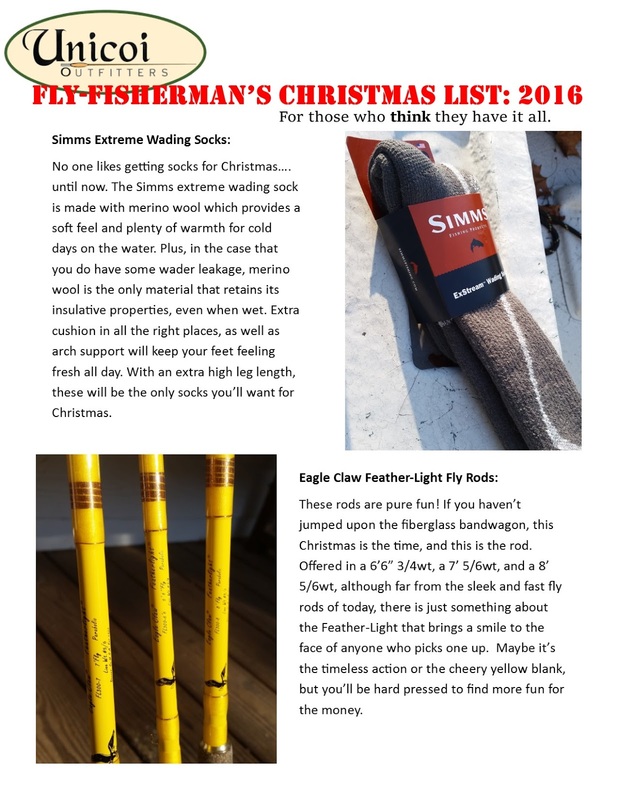 Click on the image below to go to our Holiday newsletter - full of great gift ideas for fly fishermen! Join Unicoi Outfitters for our FREE Orvis Fly Fishing 101 class and received a free one year membership to Trout Unlimited. Every Saturday throughout May and June we offer this introductory 2-hour seminar from 10 AM until 12 noon at our shop. to reserve a spot in the class. 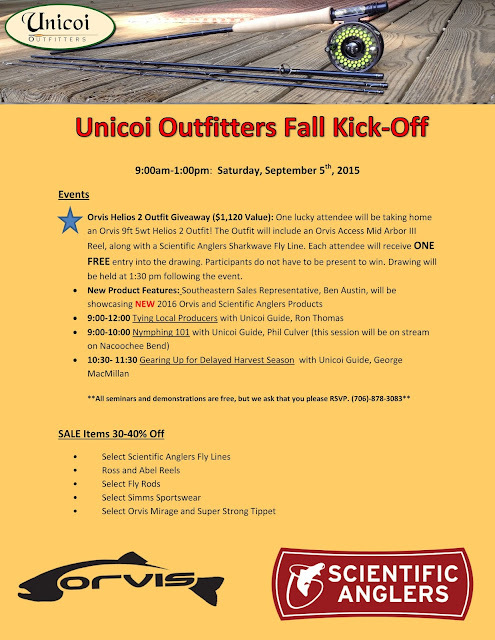 This is the perfect way to find out if fly fishing is the sport for you or someone you know. We also offer the advanced Fly Fishing 201 class on Sunday mornings, 9 AM until 12 noon, through the end of June. 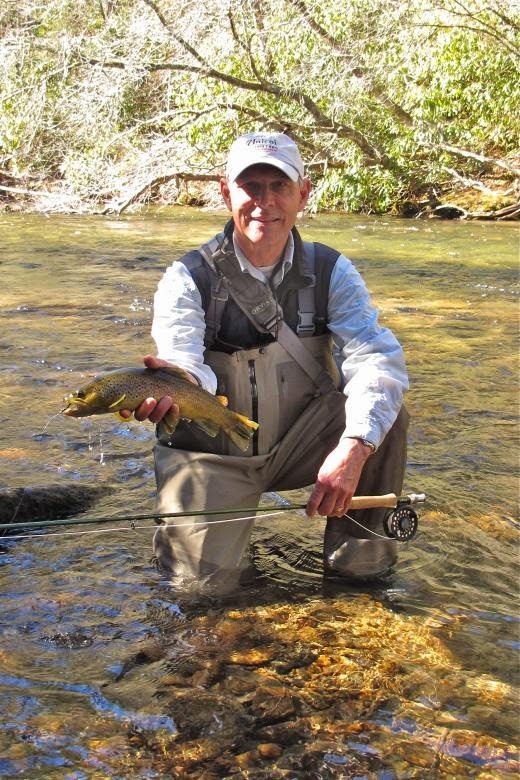 Anyone who has participated in the Fly Fishing 101 class is eligible for the 201 class. Our Fly Fishing 201 classes are two full hours on the fabled waters of Nacoochee Bend learning the specifics of fishing with a fly rod. Cost for the 201 class is only $50. Once again, participants must register ahead of time. The Dry Fly Switch is ON!!! Received this report from Dredger last night. If you can get away for an evening of fishing, now is the time to do it! Two sizes of cahills and three favors of stonefly (lemon, lime, and some large grapefruits) filled the Andrews skies last night. Sporadic large helicopters (aka Green Drakes) launched during daylight hours. Whitewashed versions of the copters hovered over the riffles at dark30 (see Coffin Fly pic). Switch was on from when I got there til 8:55pm. Dries were best in last hour. Sure beat Monday's dark30 trip to Chattooga DH, which ran 69 degrees due to recent hot spell. 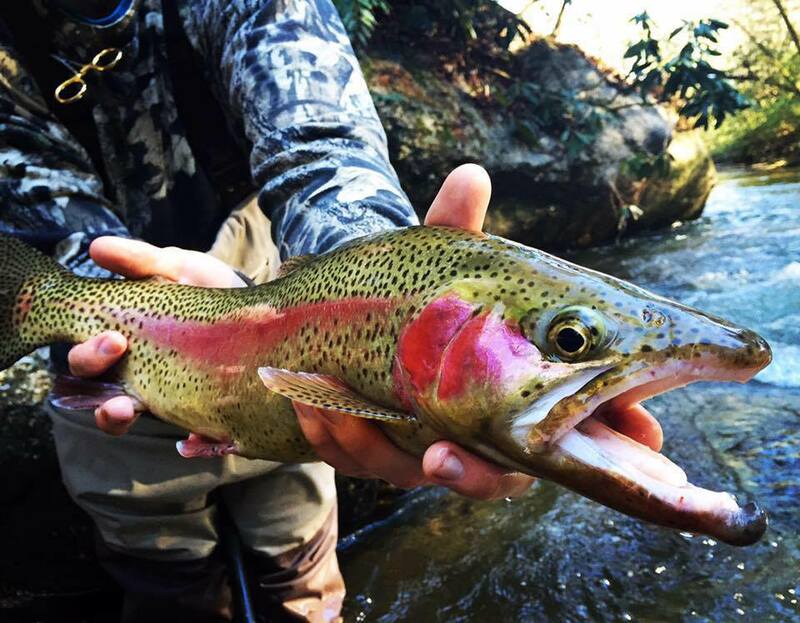 Chattooga had fished great over the weekend (maxed at 65f). 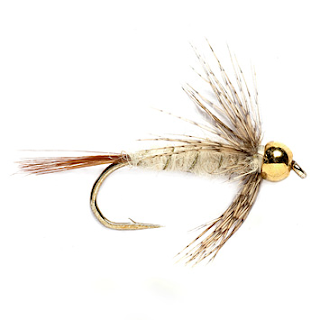 My Go-to rig on the Nantahala was 14 Cahill on 5x with a 16 soft hackle hares ear three feet off the back, on 6x. Add one size 6 dinsmore shot about 8 inches above the wet, and high stick that rig thru riffles and boulder fields. Stay out of deep pools if you're into numbers. All three stocked species and a bunch of wild rainbows were brought to hand. Think I caught some small wild browns, too. Got tired of catching them, so I cut off the wet and stayed on top to gimme a break. Almost had lifetime supply of bucktails, too. Unfortunately, they were all attached to bucks' butts. Thank God for near misses on Wayah Road's trip home. Go get em, folks. And watch around the curves on your drives home! You know, I have been in favor of year round trout streams in Georgia for as long as I can remember but I'll have to admit that when this past Saturday rolled around I did have an unusual feeling that something historic had just happened. It wasn't that I was having "buyers remorse" for advocating the end of traditional opening day. It was more of a time of reflection on opening days past. 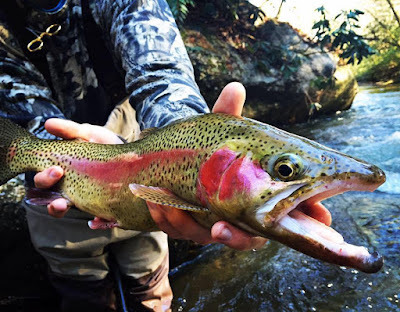 Admittedly, in the last couple of decades, opening day hasn't meant much to me because I fish year round streams both here in Georgia as well as North Carolina and Tennessee. No, it reached much farther back into the recesses of my mind to that very first opening day 45 years ago. My college roommates and I spent spring break camping across the top of the state looking for trout. It turned out to be a life changing experience, one that I'm still enjoying all these years later. We were all spin fishermen, rigged with #8 Eagle Claw hooks and red wigglers. Blue jeans and old tennis shoes and a pocket knife sharp enough to clean our catch rounded out our equipment. No breathable waders, felt soled boots, polarized sunglasses, 5X tippet, hemostats or even nippers. And it was COLD that opening day! No one in my crowd, to my knowledge, had ever heard of climate change. All but one of us grew up at or below the Fall Line and all we knew was that in April you no longer had to be concerned with cold weather. So we dressed accordingly. he purchased on a piece of cardboard at his local hardware store. If he caught any fish, I don't recall but the impression it made on me as I simply watched him fishing was obviously profound. opening day was clear and cold. Steam rose from the creek as the sun peaked over the ridge much as it had as Edwin stepped into the water that April day, 1970. Only this time the fly rod was in my hands. In honor of days past, I had decided this day I would be fishing a fiberglass rod. 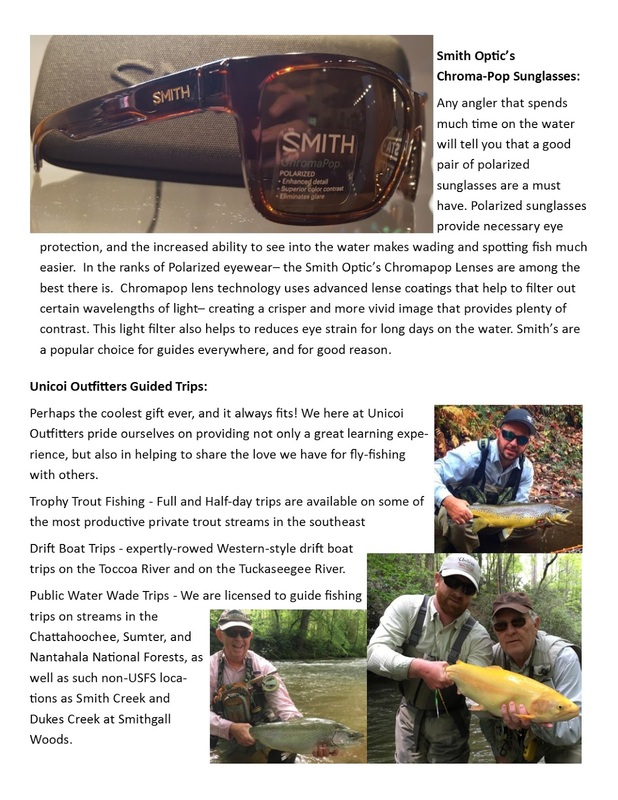 My little Orvis Superfine Glass rod was made for this experience. So comfortable in the hand that it becomes an extension of your body as you cast to and, hopefully, contend with a fish. We had hoped for some dry fly action and Bryan did tie on a Stimulator with a Pheasant Tail dropper but we both knew the odds were stacked against us. It was 30˚! 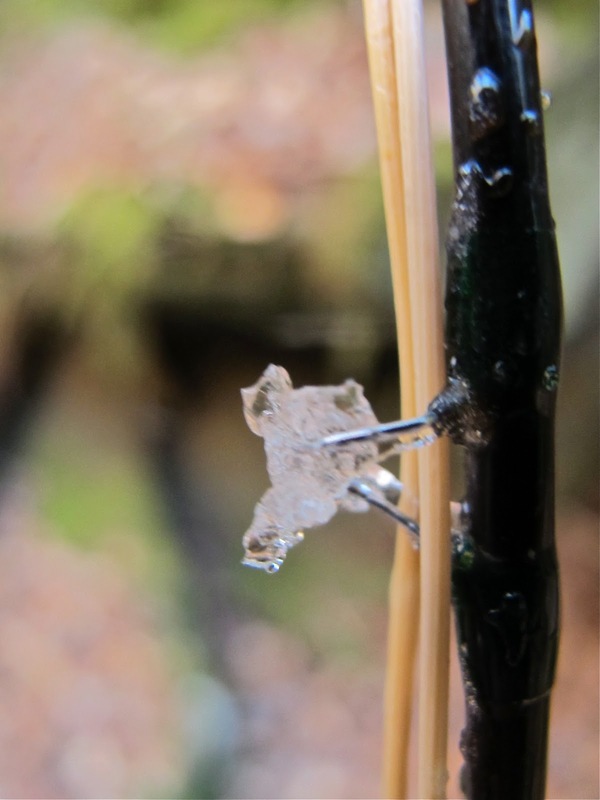 Ice was forming in the rod guides. Not long into the morning I changed my nymph to a heavier woolly bugger, set the strike indicator at full depth and cast into the same pool I had been working for 10 minutes. First cast I had a strike but missed it. On the second cast, I was ready for the brilliantly colored 10" rainbow. Naive fish may be a small casualty of the new year round trout season but I thoroughly enjoyed this one. the safety of the bottom but that springy resistance helped quickly bring her to hand. Bryan yelled above the roar of the creek to ask what fly I was using. After some quick photos, I gave him my rod and encouraged him to fish his water again, this time getting deeper with the larger fly. No more than a half dozen casts and the Superfine is into a major bend. A big grin is showing through Bryan's beard. We both know this is a special fish for this small stream. Everyone gets the idea that you don't break out the camera for a fish like this until you hold it in the palm of your hand. It's just bad luck, plain and simple. I couldn't resist and started snapping shots of the struggle. It was too good to pass up. As he slid the fish across his hand, my only thoughts were of how glad I was the fish chose Bryan and not me. He's moving across the country and won't get this opportunity again for a while. The fish was magnificent; not just for this small stream but for any stream. Fourteen or fifteen inches, very few but beautifully colored spots and huge buttery fins. I told her this encounter should make her more wary when the next anglers came through. Their intentions may not be as gentle as ours. So, on this last opening day of trout season in Georgia, I made more memories. This time, like the first, with one of my best friends. I don't know where Edwin is these days but I think he would be proud that he had such a great influence on my life. I hope you enjoy these pictures from our morning. We know, we know. This IS The Liars Club. But this is real and it's a very big deal for us. It just goes to show that any and all of us can make a difference if it's important enough. 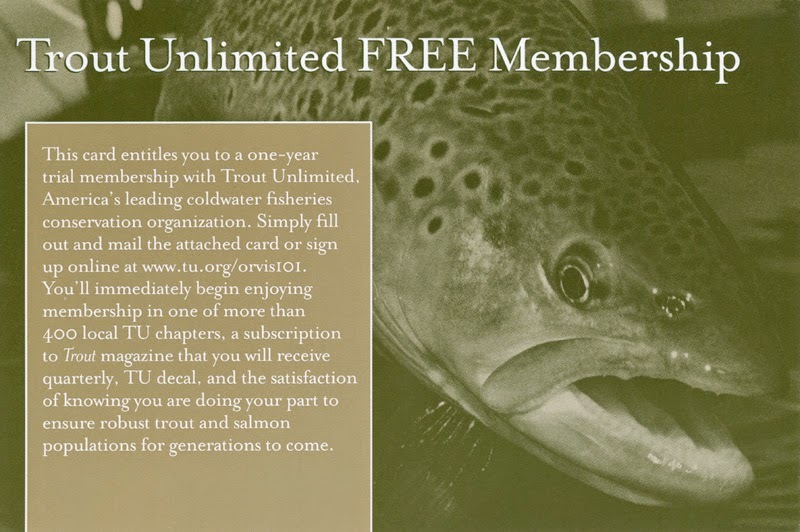 Thank you to Trout Unlimited and to all our customers who have made our support of cold water conservation a possibility. One of the great things about conservation is that while on the surface it’s about fish and fish habitat, at a deeper level it’s about people. It’s about people who care. And in conservation, as in life, you soon learn that there are people who will never let you down. These are the reliable supporters, the people that always have your back financially and politically. They come from all over the country and from all walks of life. These “go to” guys and gals – the “A Team” - will be there to support the work that Trout Unlimited does year in and year out. So it is with Jimmy Harris and David Dockery and their staff at Unicoi Outfitters in Helen, GA - our newest TU Gold Level Business member. Consider these words from Alan Folger, TU Veterans Services Partnership Director: “Few individuals have done more to provide healing and rehabilitation to our nation’s veterans. Whether through their personal and business generosity - or their very important fundraising efforts, Jimmy and David have always been there for TU and our veterans. Or this testimonial...click here to read the entire article. If you have been like me the past few weeks, then you’ve been stuck in a rut. The cold has been getting us down. Whether it was the ice storm that knocked out power across North Georgia or the five inches or snow, it was just not very much fun to be outside, let alone fish. Not to mention the fishing was following a rut as well. There were certainly fish to be caught but it mostly was the same general pattern involving deep nymphing with protein in the form of a stonefly or leech while trailing a small nymph or midge behind it in the hopes of bouncing it into the baseball sized feeding window of a sluggish trout hugging the bottom. It certainly can be effective and fun but it can also quickly become boring and repetitive. Fortunately, this weekend marked a stark change in the weather pattern. We had beautiful blue skies and the first series of days with temperatures hitting the upper 50’s and 60’s in quite some time. And the fish responded nicely. We hit the Nantahala DH on Saturday and things were looking optimistic from the moment we got on the river. The water was a little high from the rain a couple days earlier but it was warm in the sun and I seriously questioned my choice of jacket over my waders. The fishing was nothing short of phenomenal throughout the course of the day and my buddy and I easily stuck over 100 fish in the net between the two of us. We nymph fished exclusively using a Czech setup and caught fish on a variety of flies, although a team of #14 and #16 hares ears caught the majority of my fish. The fish were sitting in the boulder fields the Nantahala is famous for and we often caught several fish out of the same pocket. We even saw a glimpse of what was to come in the next couple of weeks. Bugs! We saw a handful of Quill Gordons, grey caddis and what was either a small black stonefly or a black caddis. Unfortunately, I only saw two fish rise all day. I was completely satisfied with the catching, but still not fully satiated for what I was hoping for, the first dry fly fish of the year. Well, that changed Sunday afternoon. I did a walkabout after church at Smith Creek then ended the day with the last hour on the river in Helen. When I got out of the car, I saw a few grey caddis fluttering around close to the water. That’s when I saw it over against the far bank, the all too familiar splash of a caddis-chasing trout! My #14 grey caddis soon flew towards the seam where the fish was holding and was quickly engulfed. She wasn’t a big brown but she was wild and absolutely beautiful! I thanked her and sent her back into the hole to keep doing what she does best. Afterwards, I called it a day, fully satisfied! The moral of the story of this weekend is to start thinking positive as Spring is finally upon us. The wet weather this week may set it back a bit but it is only a matter of time. Click here for what is to come. Got Caddis and a big parachute Adams?! What would possess an aging fly fishing dude to pull an equally aging old drift boat over 4 hours through the mountains in the dark in the middle of the winter, grab a Slim Jim, Diet Coke and Little Debbie Oatmeal Creme Pie for dinner because all the restaurants near his destination are closed when he rolls into town, then lie awake for most of the night anticipating his 4:30 AM alarm so he wouldn't miss this bucket list fishing trip? Aliens! That's it. Aliens. Something other-worldly. Something resembling an illicit co-mingling of an alligator and a python with a bifurcated tail. A quarry potentially three-quarters the size of myself, full of bad attitude and a reputation of trying to bite you even as you attempt a release. We're not talking biting gums with a few rough spots to hold their prey. We're talking some serious dental work that can cut you deep, wide and frequent. This is the apex predator in these parts. Nothing, absolutely nothing scares these critters, not even when they're hooked on the end of your line, thrashing in your net. That's not fear motivating them, it's downright meanness and they are mightily offended that you had the audacity to interrupt their plans for that day. We are talking, ladies and gentlemen, about the fish of 10,000 casts. Esox masquinongy. Muskellunge, more commonly referred to simply as musky. The genesis of this escapade was some young friends whom I sort of mentored along their fly fishing way in life a few years back. How they came to be obsessed with stalking only those finned creatures of legendary disappointment I do not know. The fact is, these days they're chasing either steelhead or musky. Ordinary trout, bass or bluegill have long since been cast aside for the unquenchable desire to fish only for those species no one catches on a regular basis. As young as these guys still are, they've each got, on average, over 15 years of fly fishing experience but it's almost as if they skipped some of the stages we mere mortal anglers go through. You remember, you want to catch a fish, then you want to catch a lot of fish. Soon you want to catch a big fish which progresses into a desire to catch a specific big fish that requires a higher level of skill and then, finally, you want to catch the fish that no one else can catch. I don't recall these guys going through some of these interim stages. You should only desire those final two stages after a long life of fishing. Yet, here we were. Me right in there with them, wolfing down a gas station pork chop biscuit in the dark and cold while launching our boats. Anticipation was high, but it always is with folks of this persuasion. If you don't think every cast to these prehistoric monsters could be THE cast of the trip, then you don't belong here. Perpetual optimism is mandatory. You don't count catches in this game. You count follows and hook ups. Hoping the end of the day has you with at least one in one of the categories. Seriously, it's like sighting an Ivory Billed Woodpecker! The sun did come up that day, highlighting everything in a bright halo but failing to generate much heat. It wasn't unbearable but I did leave all my clothes on all day and my fingers never worked to their full capacity. It was actually during a brief moment in time while I was attempting to pull my fleece gloves on that I had my first and, so far, only encounter with old Esox. With the boat anchored just upstream of a short set of rapids, I cast my fly down and across into a small back eddy and let it swing into the rapids as I tucked the rod under my armpit and adjusted my gloves. Unexpectedly, less than 15 feet from my position in the front of the boat, the rapids exploded as a huge musky attacked my 12" long fly as it swam back and forth in the current. Instinctively, I reacted by twisting my entire upper torso in an effort to set the hook while holding on to the Winston 10 wt. with a three-point anchoring position; underarm, right hand somewhere around the hook keeper, but certainly not on the grip, left hand just forward of the stripping guide. I tell you it was poetry in motion as all my fellow anglers suddenly erupted into a cacophony of undecipherable screams and yells. I leaned into that Winston rod like a roping horse into a calf and nothing was happening. I couldn't budge the big fish so I leaned hard to my right trying to move it sideways rather than upstream. The fish didn't like that at all and began taking line from a seriously cranked down Abel Super 9. As it swam toward a log jam, I leaned harder but noticed the line as it curved around a mid-stream boulder. "This ain't gonna be good." flashed through my mind. Seconds later the line went slack. My heart rate still pumping steadily at around 175, 180. And all is quiet. I can hear the swoosh of blood in my ears. My fingers are no longer cold. I have no desires right now other than just one more chance to do it right. The consensus of the once screaming groupies was 35 to 40 inches at least. I'm good with that. It was over in the blink of an eye but, strangely, it's still with me. I can still feel that unbelievably heavy pull. Unlike anything I've tussled with since those 20 pound sea run brown trout at the end of the world in Tierra del Fuego. It was that kind of essence with which I was briefly connected. It was as if my first contact suddenly became an unforgettable part of my being. Like my fishing life changed abruptly right then in less than a couple of minutes. Like, like I've got to do this again some time soon. Have my new young mentors warped my life the way I once warped theirs? They do crazy things to have a shot at connecting with these fish. Is this what I have to look forward to? Musky Enchiladas from Revive Fly Fishing on Vimeo. Nantahala Report - Find The Sun! Against my better judgment, I decided to take the trek over the mountain yesterday and headed up toward the "Land of the Noonday Sun." I think the Cherokee were on to something, so I decided to play the "Old Man" fishing game by sleeping in and not having waders on until 11:00. Even then the water/air temperature did not make conditions favorable as it barely hit 40 all day and there was still a light dusting of snow on the ground in heavily shaded areas. I didn't measure the water temperature but it for sure felt below 40 by a good bit. Fishing started out slow for the first hour and a half I was there and I really think it was due to being in the shadows and staying cold. Once I hit a heavily sunlit stretch at about 12:30 or so, it was game on! The same flies I had been throwing earlier suddenly found their way into the mouths of many hungry and aggressive stocked and wild rainbows. I fished with a "deep" dry-dropper rig consisting of a big Klinkhammer as a strike indicator, with a leech or squirmy worm tied on jig hooks catching most of the stocked fish. I had a #18 natural pheasant tail dropped below that, which caught most of the wild fish. In the couple of stretches where I fished in full sunlight, #20-22 Blue-Winged Olive mayflies and small black stoneflies were hatching and a few fish were splashing after them. I caught several on a tiny BWO parachute, which was a nice change of pace from dredging! Once the sun started dropping below the ridge line, the fishing in the DH tapered off significantly and by 3:45 I felt like it was over. I decided to head down the road and try the lower river, the rafting section. The water temperature was considerably warmer down there and was certainly above 40 degrees with maybe a couple numbers to spare. Duke Power was running water but it was not nearly the flow that it is during the recreational releases of the summer. The best part, there were no rafters. The fishing was fantastic too! I caught just about as many down there in the last hour and a half of daylight as I did in the whole afternoon up on the DH. I was doing my same dry dropper rig, but only rigged about 2ft deep down to my leech. The wild fish in the lower section were absolutely tearing it up. 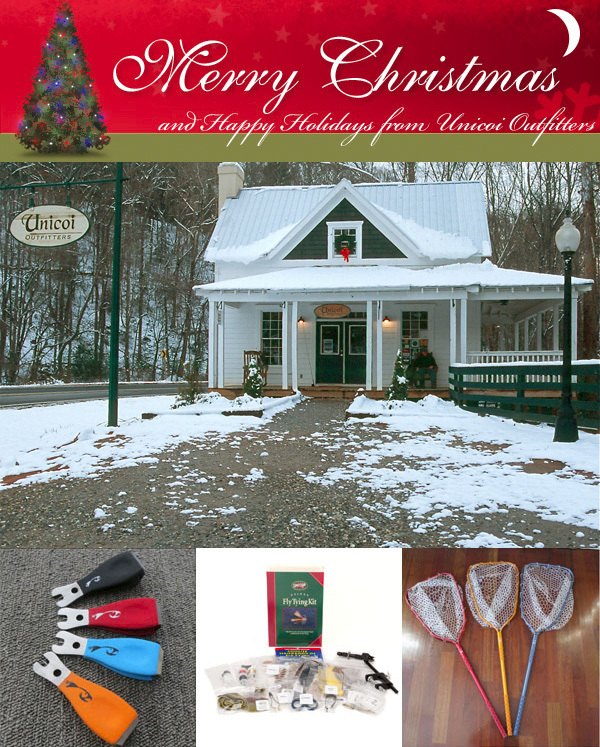 Hope you have time to get on the river over the holidays. Remember, "find the sun"! Thinking of Buying A Kayak for Christmas? Thinking of buying yourself a 'yak for Christmas? Here are some of the points you might consider. Last year my wife and I finally got a pair of kayaks. I'd had a chance to paddle a friend's kayak once or twice before, but never had a kayak of my own to spend some serious time with. Even after a couple decades of small-craft boating, I was quite impressed with the portability and versatility of these craft. Here's some of what I've learned in the past year. Cost: If you've been thinking of taking the plunge with a kayak, there's never been a better time. Kayaks have become very popular in recent years, meaning that more manufacturers are making them and prices for an entry-level kayak are even lower than they used to be. 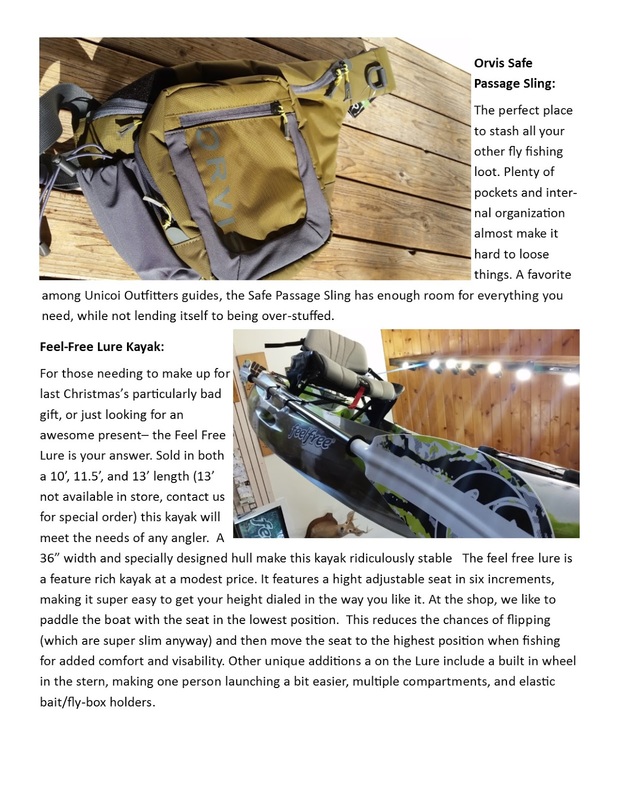 Standard kayak models start at a low of about $200 on sale, but you'll want to spend more for a fishing kayak that comes complete with rod holders and other angling amenities-expect to pay from $250 on up on sale. You'll also be buying a double-bladed kayak paddle, which will run you $50-100 or more. Most kayaks don't include a padded seat, and you'll probably want one; add another $50-75. Yes, the tab is adding up pretty quickly, but you're still well under what the cheapest johnboat and trolling motor will cost you. Smaller accessories, such as a light anchor and-of course!-a life vest, you may own if you're already a boater. Sit-on-top versus sit-inside: There are two basic kayak types. A sit-on-top kayak is a sealed hollow shell with molded seating on top to accommodate the paddler. It's easy to get in or out of, a major plus if you plan to kayak-and-wade. The kayaker sits above the waterline, which increases visibility and casting distance, but leaves the kayaker exposed to waves and splashing. Storage space is mostly open to the elements, but is easily accessible. However, there will probably also be one or two watertight hatches that allow dry storage inside the kayak shell. Note the size and location of the hatch openings, as these will limit what you'll be able to fit inside and whether you'll be able to reach them from the kayak seat. Water that splashes into the kayak drains out through scupper holes, which can be plugged to prevent water ingress, if you'll be on calm water. Fishing kayaks: The simplest thing that defines a "fishing kayak" is the presence of rod holders. A fishing kayak will also usually be wider than standard kayaks-around 30" or so-and therefore more stable. 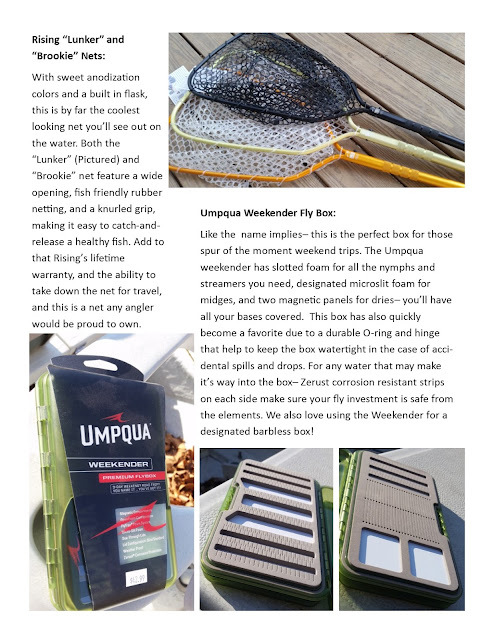 It may have extra storage features, like molded in tackle trays or even a baitwell. Note that you can add after-market rod holders to most kayaks, but you're better off starting with a fishing kayak, mainly for the added stability. A wider kayak won't cut through the water as quickly as a standard model, but you'll be able to cast, set the hook, and land frisky fish without feeling like you're about to take a spill at any moment. I was really surprised at how stable my kayak is-definitely less tippy than most canoes I've used. Length: Length is important. A longer kayak will travel faster and more efficiently (and have more storage space), but weigh more to load and carry-especially important if you're cartopping or portaging. Twelve to thirteen feet is a popular range for saltwater anglers, and will provide a roomy and stable freshwater fishing platform too. However, if portability is important, look hard at kayaks ten feet or less in length. My ten-footer is a lightweight at exactly fifty pounds, but I'd still swear it's half full of water when I hoist it back onto my roof racks at the end of a long paddling day. The weight is much easier to handle if you're securing your craft to something below shoulder level, like a pickup bed or trailer. A kayak cart can also be a big help moving your boat from car to water (more on that later). Long story short, consider weight an important factor based on how you're transporting your kayak. Paddles: Kayak paddles are double bladed, unlike rowboat oars or canoe paddles. This makes the kayak an extremely efficient craft, because you propel it with both the forward and what otherwise would be the "back" stroke. Paddles come in specific shaft lengths, which you choose based on the width of your kayak and your height. The wider your kayak and the taller you are, the longer paddle shaft you will need. Kayak and paddle manufacturers provide tables for making your best choice. Paddle blades also vary. A long narrow blade works well for propelling a kayak nonstop over long distances, while a short broad blade works well for tight maneuvering along brushy shorelines and the stop-and-go travel a kayak angler will likely be making. In Florida's lakes and ponds, most anglers should stick with a broad blade. As a side note, be aware that some fishing kayaks are equipped with various ingenious pedal-and-propellor systems that make propulsion a lot easier and leave your hands free for fishing. These are nice, but significantly more expensive, and are generally restricted to longer kayaks. Some kayaks can be outfitted with a trolling motor; note that you will have to register the kayak if you go this route, and will need room for a 12-volt battery. Accessories: Your number one accessory is your life vest, or PFD (personal flotation device). I prefer an inflatable PFD for its coolness and light weight, although many kayakers will tell you that you're going to tip over (and activate the CO2 cylinder) sooner or later. Your risk is less in stillwater ponds and lakes; however, I'm willing to live with that possibility, especially during the summer heat. Make sure you are also complying with all other boating safety requirements (MyFWC.com/boating/safety-education). Another "must have" accessory will be a dry storage bag for keeping your phone, electronic car keys, camera and other sensitive gear safe from the elements. If you are going to have to carry your kayak any distance between your parking spot and the water, consider buying a wheeled kayak carrier. These handy little carts strap onto the bottom of your kayak, allowing you to roll your craft to the water. An advantage of these is that you can load all your equipment into the kayak as well and make a single quick trip, rather than going back and forth to your vehicle for paddle, anchor, rods, etc. or having to try to carry them all at once. Strapping the wheels in place near the kayak's center of gravity will provide a balanced and effortless walk to the water's edge. Some kayak manufacturers offer carts that will fit right into their kayaks' scupper holes, eliminating the need for straps. One of the (few) annoying things about fishing from a lightweight kayak is that it is easily pushed around by wind or waves, so you'll want a lightweight folding anchor to help you stay put. An anchor works best in deeper water or when you'll be staying put for a little while, such as when fishing bait. If you use the anchor a lot, you'll want an anchor trolley that allows you to position the anchor line fore or aft, depending on wind or current and how you want to position your craft. For frequent moving and anchoring-which I've found to be the norm for lure fishing-a stakeout pole is much more convenient. This is simply a pole pushed into the lake bottom to anchor the kayak. The pole can be inserted through a scupper hole, or attached to the kayak with a short rope and snap clip. Many anglers prefer a stakeout pole over an anchor, because there's less chance of tangling with a scrappy fish. You can buy a commercial stakeout pole, or make your own out of PVC pipe or any other sturdy pole such as an old golf club with the head removed. Use is obviously limited to fairly shallow water, depending on the length of the stakeout pole. There's a host of other accessories available: extra or specialized rod holders, rod and paddle tethers, depth finder and camera mounts, special kayak tackle holders, baitwells, and more. Kayakers (and kayak manufacturers) seem to be a particularly inventive lot! Customizing your kayak for your comfort and specific fishing needs can not only put more fish in the boat, but also be a satisfying end in itself. Care and feeding: One of the great things about kayaks (especially if you've ever scrubbed down a large boat after a saltwater fishing trip) is that they require almost no maintenance. Just hose your kayak off after a muddy or saltwater fishing trip, stow it out of direct sunlight, and that's about it! With minimal care, a kayak will last for years. Fishing from a kayak: Okay-you already know how to fish. But fishing from a kayak is different, even from fishing in a small canoe or johnboat. While fishing kayaks are usually very stable, you must keep your balance in mind at all times-when leaning over to unhook a snagged lure, setting the hook or netting a fish. While fishing kayaks are roomier than their standard-sized brethren, space is still at a premium. Many of your kayak customizations, if you make any, will probably involve gear storage. I don't like much in my way while kayak fishing, and keep minimal gear (like hooks, plastic worms, and pliers) in a small tackle box or tackle bag in front of me. The rest of my tackle, plus raingear, sunblock, etc. are in a larger waterproof duffle bag stowed behind my seat. I don't need to move to release a fish, tie on a new hook, or change out my worm. If I need something more, I can reach back to grab the duffel bag, or hop out in shallow water to grab it. Water or sports drinks-a must for the Florida kayaker-go under the bungee straps in the front or rear of my kayak, depending on the rest of my loadout and available space. My kayak actually has a cup holder right in front of the seat, and a sports drink goes there right away when I launch. I'll work a shoreline or deeper water the way I normally would from any small boat. However, since I'm sitting low my casting distance and visibility are more limited, so I sometimes have to work closer. Thankfully, a stealthy kayak is ideal for this. I can often paddle along just casting as I go, but sometimes wind or wave action requires me to anchor my stakeout pole at every stop. A stakeout pole or anchor also help when you hook a bigger fish. You'll be able to land most fish with ease, but I've had hard-fighting fish as small as four pounds take me for a brisk "sleigh ride". This can actually be fun in open water, but if you're casting anywhere near docks or submerged brush you'll want to anchor yourself if you hope to have any control when "the big one" hits. And when he does, a kayak will put you closer to the action than anything else except wading. The kayak advantage: Besides simply being fun and exciting to fish from, kayaks have one more major advantage: portability. Anywhere you can stand, you can launch. Since getting my kayak, I've been amazed at the world of new fishing opportunities that have opened up for me. Some of these new opportunities have turned up at my "old" fishing holes, where I can now launch a boat off a 60-degree canal bank, or where a sliver of public shoreline lets me get into an otherwise-inaccessible lake. I recently fished a narrow canal that would have been too brushy even for a canoe. There's something eminently satisfying about catching a big fish that you know was out of reach of anyone else-except a fellow kayaker.